Based on the visitor’s location and the website browsing history, we introduce content that is contextually relevant for each individual visitor. By defining personalization rules and tagging each incentive with relavant topics before publishing, editorial staff feeds the personalization engine with numerous combinations and recommend ideal incentives to meet the needs of California businesses. California businesses needed a convenient, personalized way to find, learn about and take advantage of economic incentives that can provide a nice lift to business results. And, the State needed to a better way to connect businesses to these incentives in order to drive economic growth across The Golden State. It was a huge win-win waiting to happen but they needed a digital experience to connect business to incentives. SymSoft used Sitecore to create a new responsive website and deliver personalized content to businesses based on their browsing behavior. Like everything else in California, the solution had to scale to handle the traffic volumes one might expect when dealing with the sixth largest economy in the world. SymSoft engineered a high performance / high availability Sitecore XP solution, integrating the website with back-end data and analytics to drive the personalization engine. Business owners can now search for economic opportunities through an easy-to-use Sitecore web portal receiving personalized recommendations based on their browsing history. Business is booming! 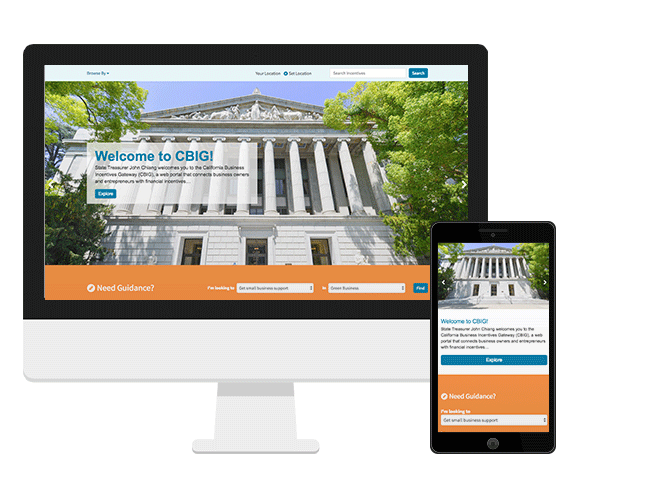 The system is designed to allow cities, counties, local government, and other State agencies to securely login and effectively manage and edit incentives. However, manually adding and updating every last state incentive to a new platform would be a never-ending task without technology such as Sitecore Content Migrator, that helped us to move the initial bulk of content. Once we had the initial content in place, it was much easier to provide training and knowledge transfer for the technical and content teams.